Citizenship brings many benefits to immigrants, the opportunity to participate more fully in our democracy through the right to vote being primary among them. But beyond the clear civic gain is an often overlooked economic benefit: for a variety of reasons, naturalized immigrants are likely to see a boost in their family incomes that can benefit their children, their communities and the nation as a whole. Why is the economic importance of naturalization -- the process by which immigrants become citizens -- so often overlooked? Part of the reason is that much of the heated debate around the economic effects of immigration in the U.S. tends to focus on the unauthorized (or "illegal") population. 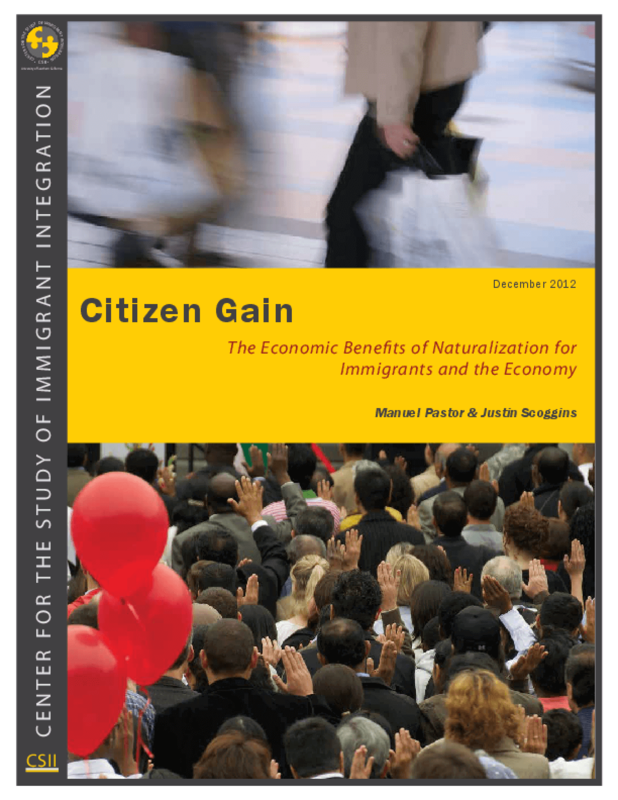 The economic evidence in this arena points in multiple directions -- positive gains at an aggregate level, negative effects on specific sectors of the labor market, mixed impacts on government coffers -- but lost in that discussion is the fact that nearly three-fourths of all immigrants are either naturalized citizens or Lawful Permanent Residents (LPRs), those who have legal status and may be eligible to naturalize but have not yet done so. What would happen if those individuals who were eligible to naturalize actually chose to do so? How much would their economic situation improve -- and what would be the effects on the overall economy? If such gains are possible, how could policymakers help to encourage even higher rates of naturalization? In this policy brief, SIIS tackles these questions by combining individual-level data from the Census Bureau's 2010 Public Use Microdata Sample (PUMS) with the most recent data on the number of LPRs eligible to naturalize from the U.S. Office of Immigration Statistics (OIS). This brief begins with a review of the literature, drawing out both theory and evidence on why naturalization might be associated with a higher earnings trajectory. The authors then discuss the data used and the regression models developed; and make a number of choices along the way to insure that the estimates presented here are as conservative as possible. The brief then discuss how the wage trajectory might change over time -- benefits would actually accrue over a number of years -- and then examines the possible impacts on aggregate earnings and the overall economy. The brief concludes with a discussion of the policy implications, particularly how these benefits might be made clear to those who have not yet naturalized and how new financial and other vehicles could be used to induce higher levels of naturalization. Copyright 2012 Center for the Study of Immigrant Integration.